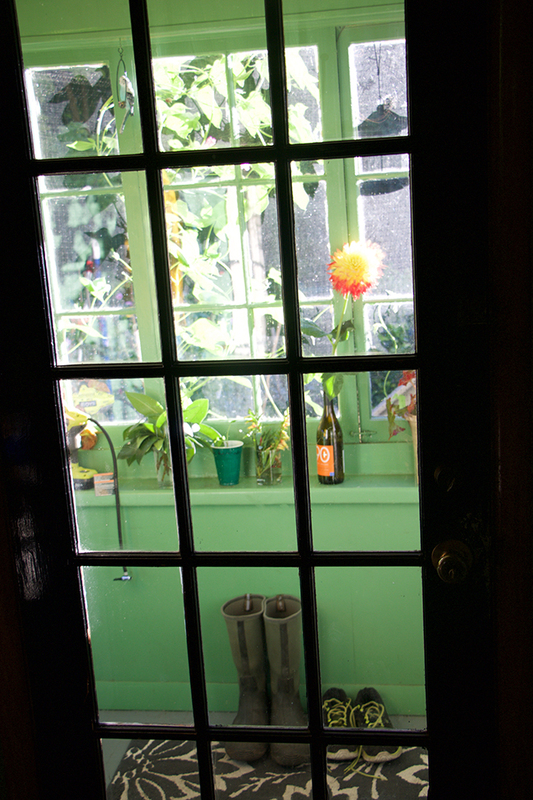 Here is a view you rarely see, peeking in through the back of the greenhouse looking forward toward the front door. I am just beginning to clean it, and to casually relocate plants from their summer vacation outdoors, to their places indoors. 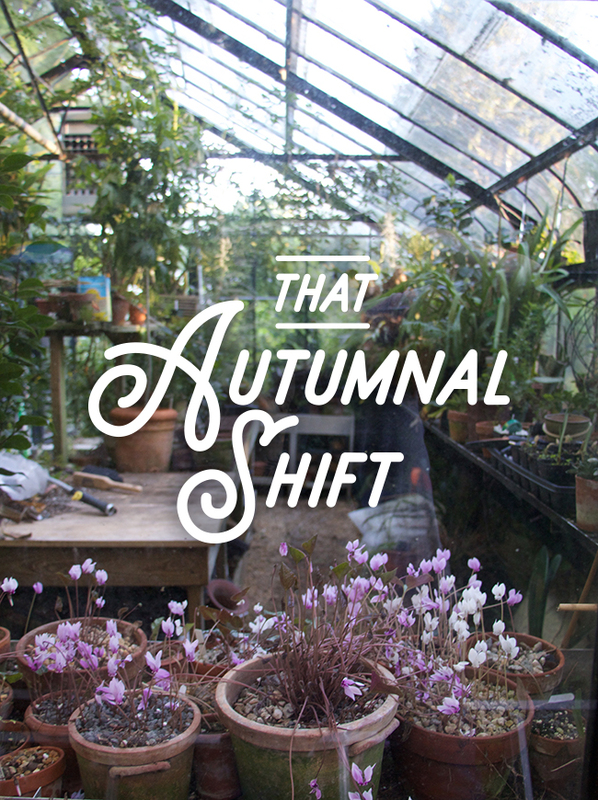 In some years autumn arrives early - at least in the greenhouse. Cyclamen can bloom as early as mid August for us, but for some reason, this year, it has arrives late, and I'm OK with that. It all came as a surprise to me, last week. I walked into the greenhouse which was till relatively empty for the summer. Pots of Nerine sarniensis which still need to be cleaned up an repotted ( a typical last for July, but I was late this year) sat on the potting bench, and even though a few flower buds were emerging, most were still dormant, allowing me to refresh some soil, and time to begin organizing the greenhouse for the winter. I love this time of year - moving plants in for the winter. As many of you know, I prefer winter growing in the greenhouse more than I do most of the summer. I feel that it controls me a bit. I can get too distracted outdoors, with so many options, but under glass, space is limited. I am adding some new collections this year - a new collection of rhododendrons, the rarer and more tender yet fragrant R. maddenii series, as well as a new collection of shrubby Erica's from South Africa. More about those, later. Maybe I'll be getting more camellias too, and bulbs have been ordered for forcing - a must, which I missed out on, last year. Cyclame graecum and C. hederifolium bloom together, in the sand plunge bed. I think the fact that I waited to water them this autumn, may have triggered them to bloom fuller. If should have provided more full sun, so that their stems would be shorter, but I am happy with their display, one of the best for me, in years. 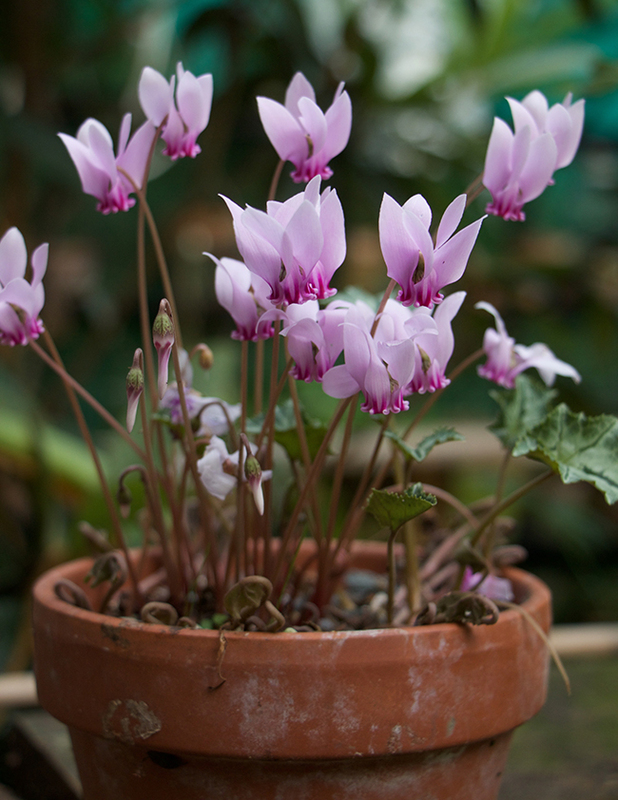 Right now, much is happening around the garden and greenhouse, beginning with the cyclamen - the wild species, various types all from southern Europe and not C. persicum, the one most of us are familiar with from the florist. As the cooler weather strikes us hard. Cyclamen are often the first sign of autumn, followed up by the Nerine which all have just had their first drink of water. Typically, I provide them with their first drink around Labor Day, but waiting until the cooler nights arrive, is smarter, and seeing the volume of bloom is telling me that this might be a good move. 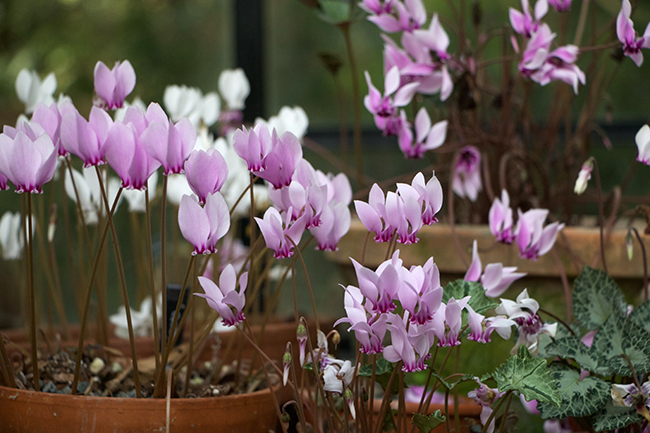 Cyclamen species do love a summer baking, well, at least most of them do. Dry forests, woodlands and shady nooks between hot rocks throughout the Mediterranean in lands like Greece where many of the choicest species grow. Cyclamen are sturdier than most people know, but it did take years for me to figure out how to grow them. I used to order seed from Thompson & Morgan back in the 80's, and once, I had one single seed germinate. Cyclamen graecum ssp. candicum, has foliage which is highly decorative. Nothing much became of that poor, weak seeding, but it was only later in life when I realized that it really wasn't my fault at all. Cyclamen seed is actually quite easy to germinate and grow into full sized plants, the only trick, if one can call it that, is to sow impeccably fresh seed (as in - straight-from-the-pod fresh). 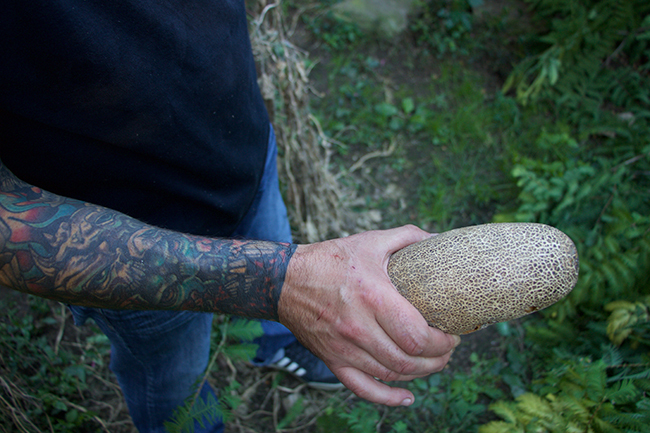 That is, if you can get to the seeds before the ants do. Ants can't help it - as the seeds are genetically designed for ants, with a tiny piece irresistible sweet tissue on each seed - ant candy, if you will, which seems to be enough of a payment for each seed to be carried away and planted here and there throughout the greenhouse and garden. Mixed species of Cyclamen bloom in the September greenhouse. A bit shady still on this bulb bed, the flowers and stems seem a little long, but they do enjoy not being disturbed, as the roots can bury deeper into the slightly damp sand in the summer, which the pots remain bone dry. Perfect conditions for most cyclamen species. Around here, ants usually do get to the seeds first (but sometimes our dear friend Judith Sellers from the New England Primula Society is faster than the ants!). She visits us annually, attending our now infamous annual party for the American Primrose Society which is usually around May 1st - just as the seed pods are ripening on the cyclamen. 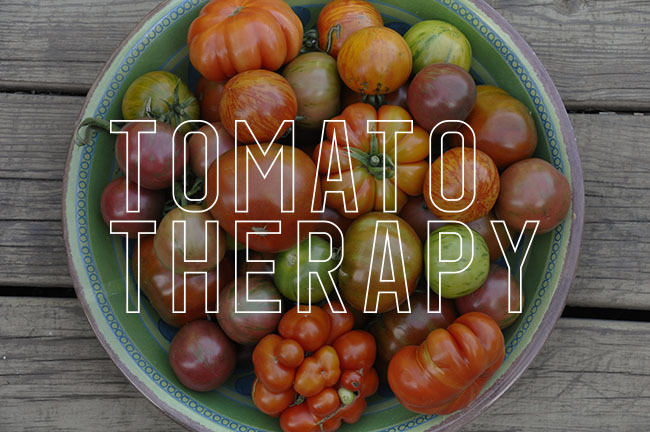 We're OK with folks taking them, as we have enough, and they usually all fess up to sneaking a few pods, usually confessing after they tour the greenhouse with a glass of wine. I sow a few pots of the nicest ones every spring, allowing the seeds to sit dormant until September, when I water them in. Seedlings emerge quickly if sown this way. 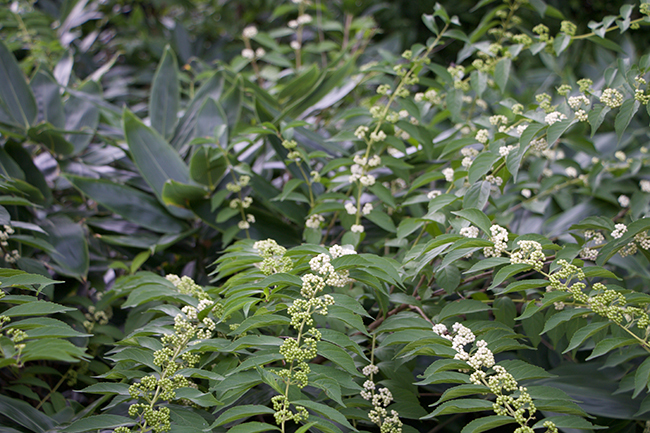 I look for seed pods from the arrowhead-shaped leaves, and the silver patterns of C. hederifolium - they are the ones everyone wants, and I love the white flowered forms. We have loads of C. graecum, a species many find difficult to raise, but a cold greenhouse makes the task effortless. The rest of the seeds are left for the ants - which means that in September, we find cyclamen coming up in all sorts of odd places. 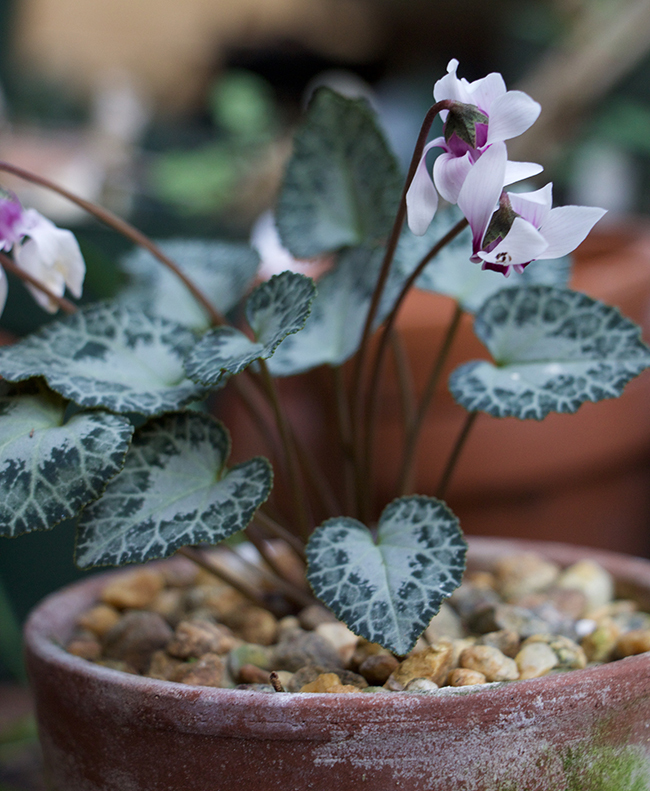 Cyclamen hederifolim, just one of the many seed-raised cyclamen in our greenhouse. 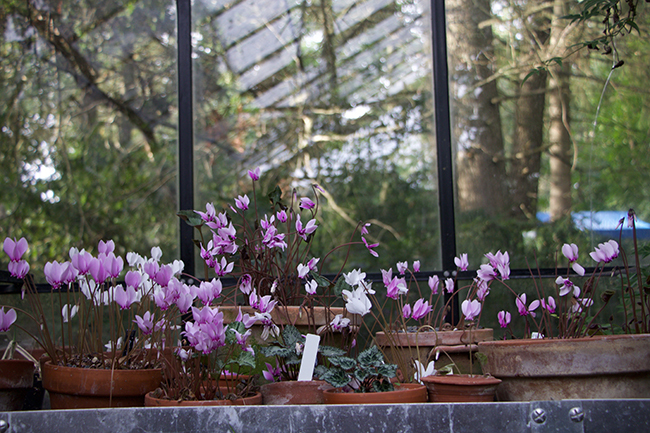 This year, our cyclamen are blooming very well, even though they were neglected throughout their summer dormancy. I did leave them alone, however, so their roots were able to go exploring deep into the sand, where they undoubtedly found a tiny bit of moisture, I guess. This is usually the trick for keeping the tender C. graecum through its summer dormancy, that or a teaspoon or two of water. Other cyclamen, can get by with only a hint of moisture, something that maybe helped both these in the greenhouse, as well as those out in the garden, for I noticed today a few C. hederifolium blooming near the walk which leads to our driveway. I single cutting of this 'Primrose Tennis' chrysanthemum has grown, through careful pinching and now staking, into a tiered pyramid form. It should be in bloom by late October. Chrysanthemums are still moving forward, even though we are getting our first hint of true, autumn weather. Today, I staked a 'Primrose Tennis' incurve, into a shape called a pyramid. A nineteenth century style of training which is based roughly off of the more traditional Japanese methods which are far more elaborate - thousand bloom pyramids and domes. My plant may only have 25 blooms, but is still somewhat traditional - I have an engraving in an old chrysanthemum book which shows one trained just like this. Much can still go wrong, and I am still learning much about how to raise and train exhibition mums - truly a lost art one of which I am steadfastly trying to not let slip away. 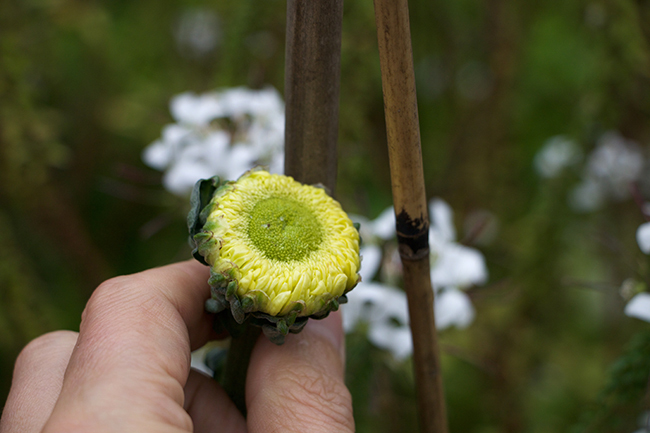 Some chrysanthemums will be very large when they bloom, like this one, which has a bud that is already 2 inches across, but still very tight. Curtis holds last of the cucumbers are still being harvested, such as this Sikim which looks rather inedible, but which made a crispy addition to a Greek-style salad for dinner along with the last of the heirloom tomatoes, oregano, lemon juice and feta. Did I mention parsley? Lots and lots of parsley, which may just be my favorite vegetable. These cold, sunny mornings in late September with just a hint of frost, are so refreshing. One is eager to get out early, and the chore lists are still long. 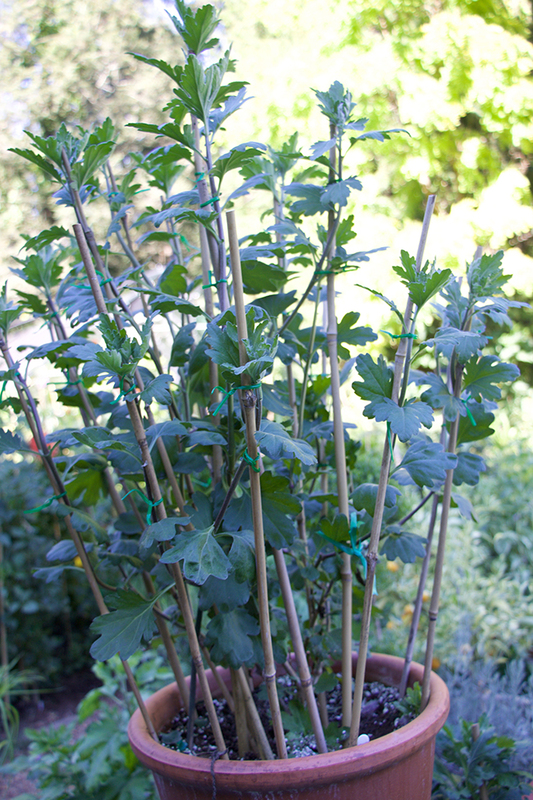 Staking chrysanthemums, cleaning the greenhouses, transplanting winter crops into raise beds are all on my list this Sunday. 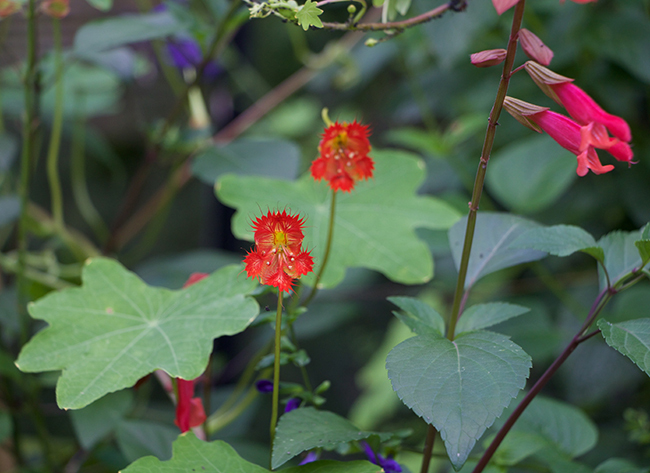 Tropaeolum moritzianum is a rare nasturtium, but one wouldn't know it, as it climbs and uses its petioles as twining tendrils (a not so nice surprise, as this vine is rambuctious - let me put it this way, it has nearly covered the front of the greenhouse including a 12 foot tall bay laurel and a tall pine. 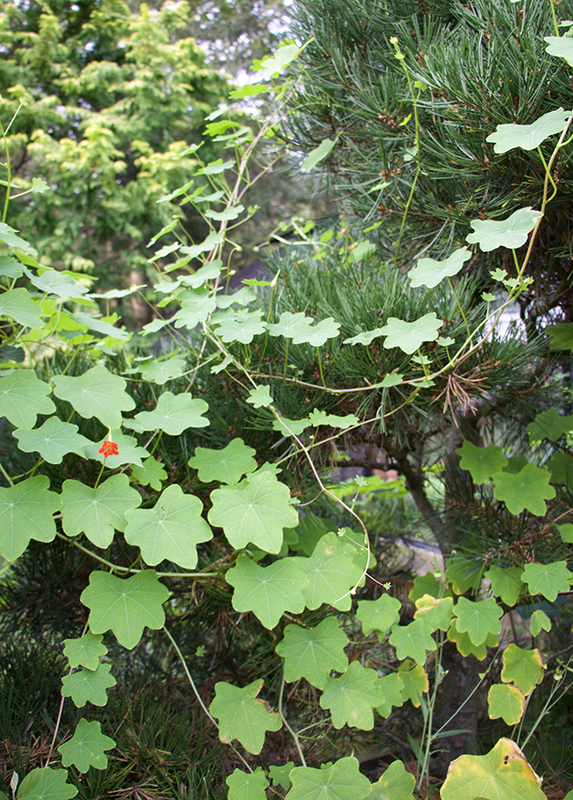 Tropaeolum moritzianum is a vine not for the small garden, but if sited right, the foliage alone can be an asset. The blossoms come late in the season however, so pray for late frosts. 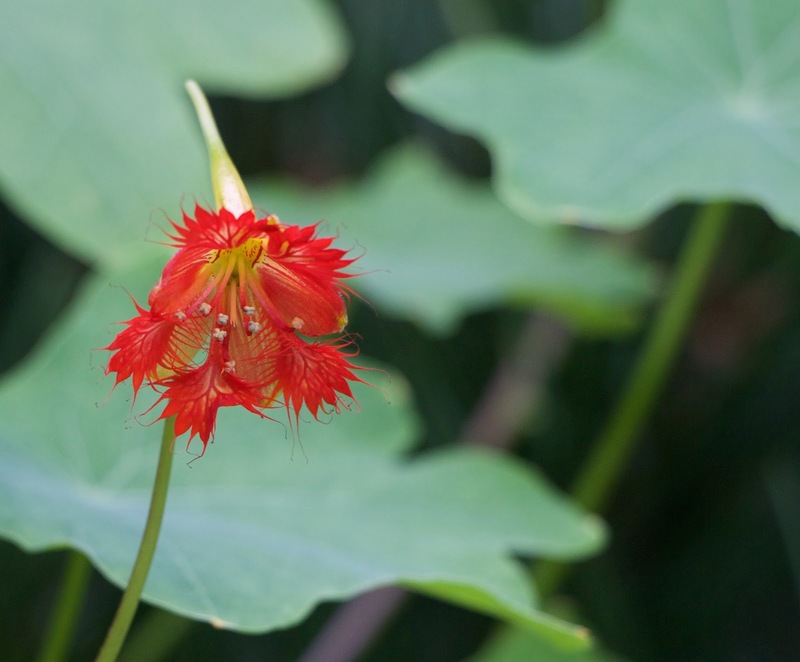 The fringed blossoms of T. moritzianum are as bright a flecs of lava. Intricately fringed with along spur, they even last long as a cut flower. Now, if only I can get some seed before frost puts them away for the season - this annual is rare, and I had been waiting nearly a decade to find some seed. 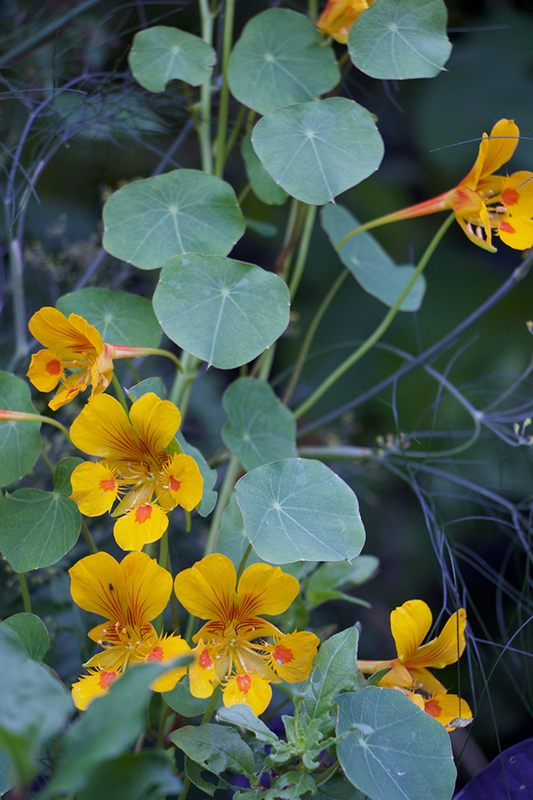 Nasturtium 'Elf's Cap' (T. minus ) is an easy-to-grow annual which is a bit easier to find ( well, not THAT easy, I had to use seed saved from last year). It always makes a nice display in the annual borders, resting a bit during the hottest part of the summer, and then doing this, once night temperatures begin to dip. It's the long spur that looks elfish. Calicarpa with violet berries can be downright too striking for some of us, but the white berried form is so much nicer. 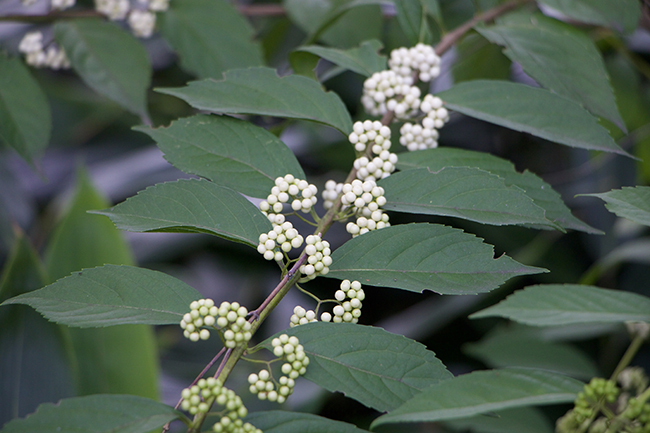 I have a thing for white berries in the autumn, and Callicarpa dichotoma f. albifructa delivers a tremendous display for more thoughtful garden designs. I do find that early frosts can turn the berries a dark tan, which honestly, ruins the effect since who wants tea-stained berries, but if the weather remains mild, the foliage could drop an a spectacular show will be the star of the garden. 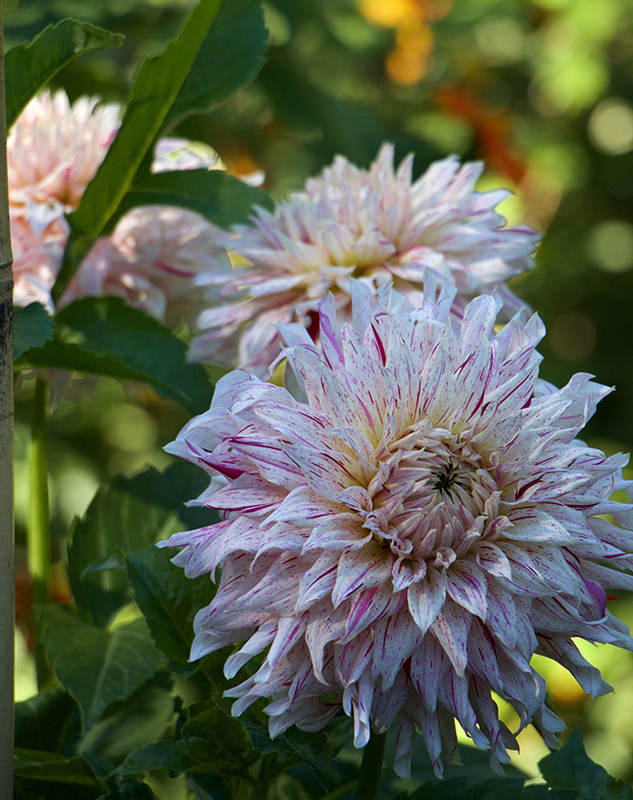 Dahlias continue, daringly so close to frost, which is what they do - blooming best last in the season. I could call this section of the garden 'little Mexico', and yes, I built a fence around it, but only to keep the dogs out. This Dahlia is called 'Woodland's Wildthing' a favorite and frequent winner on the show bench, even though mine never made it to the show bench this year, it bloomed off schedule. 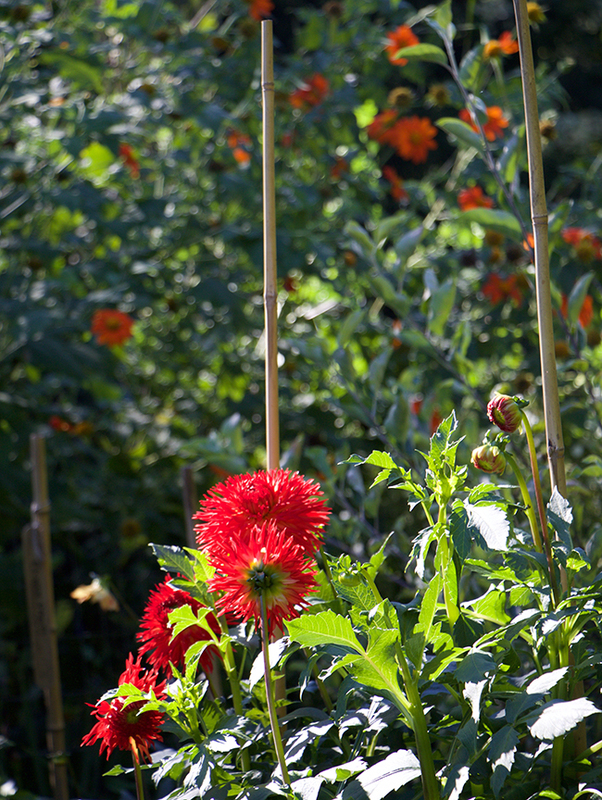 Other dahlias like this fimbriated bright red one (lost the label) bloom in the vegetable garden. In the back? Another dahlia look-alike - Tithonia, or Mexican Sunflower. These plants are about 16 feet tall again, even though it is dry. Dahlia growers who exhibit in dahlias shows seek perfection, but if one wants to grow organically, creative measures must be taken. This trick which I am trialing on 'Ms. 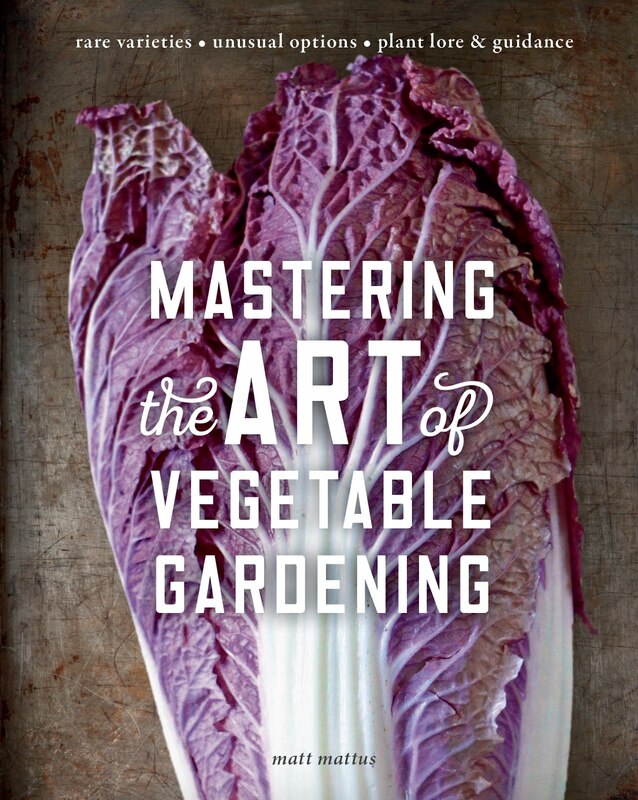 Kennedy 'I learned from Grace Lam from Five Fork's Farms which is only 5 miles from our garden. 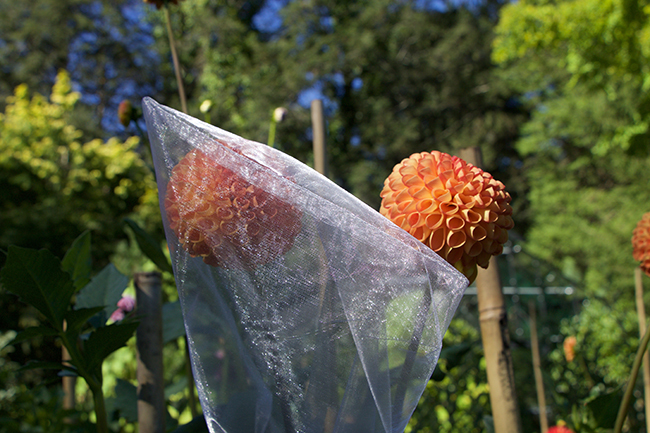 Last week when I visited her, these organza bags were being tied onto every dahlia blossoms to protect them from insect damage. A quick Google search and I found some on Amazon. I ordered silver, feeling that they would be less invasive than white. 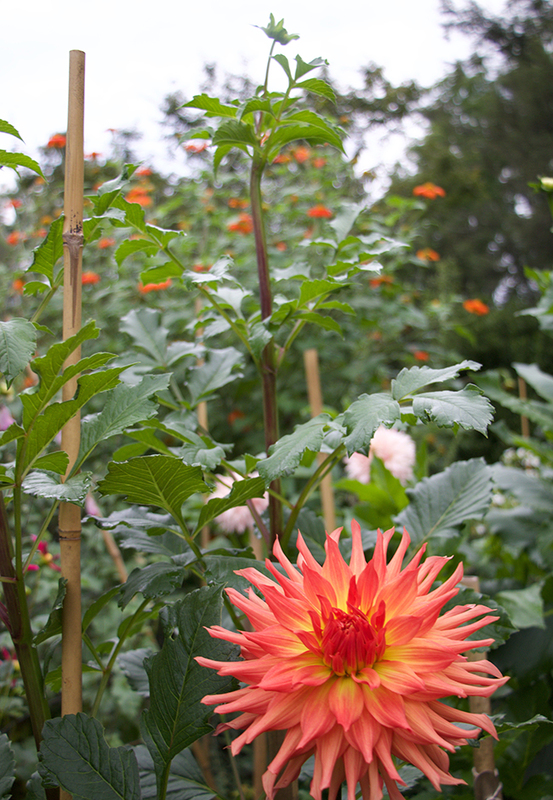 A Giant 'dinner plate' or AA class dahlia ' AC Ben', is a variety which just performs so well, and we've heard that from almost everyone who grows it. It is strong, and floriferous, at least for a dinner plate. With flowers 11 inches wide, expect only a few from each plant. I have had 6 so far. Dahlia 'Lakeview Ripple' a new introduction from Clearview Dahlias, a go-to source for exhibition types, had bloomed for me between our two Massachusetts dahlia shows, which Donna Lane, our chapter president tells me is called a 'Wednesday Garden' meaning that they bloomed off-schedule, on the Wednesday between shows. 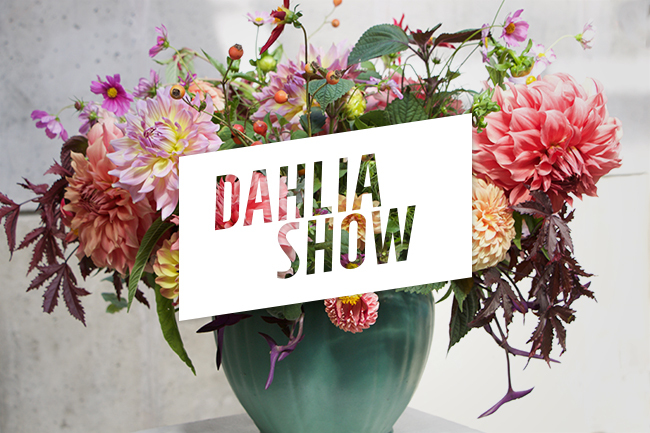 It's official, the dahlia is back, and it's pretty safe to say, "in a giant way". If you haven't noticed, the dahlia is quickly becoming falls most sought after flower for weddings, garden displays and in containers. 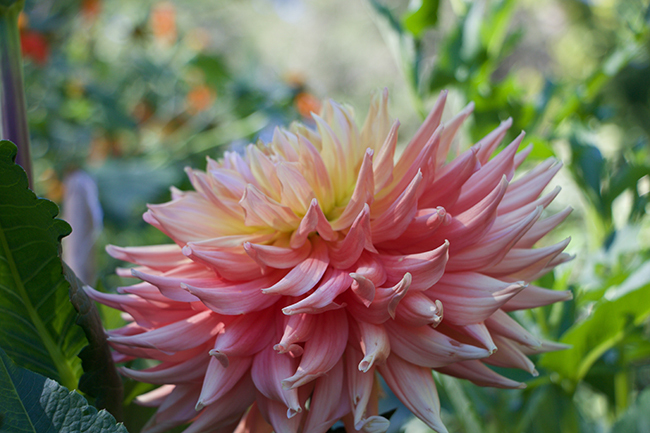 The color palettes are incredible, the forms - so diverse that there are dahlias for every style, from the tiniest 1 inch blooms of ponpoms and ball forms, to the giant 'dinner plate' types. Not to mention all of the tempting ones in-between - pointy cactus flowered forms, goofy-centered anemone types and all types of multicolored forms. A dahlia catalog can cause anxiety given the wide selection and choices one must make, but at least the don't break ones wallet - most tubers cost less than $5 so one can afford many (not to mention that by fall, one may have a bundle of tubers). Last February I announced here that I wanted to start a local New England chapter of the American Dahlia Society, but I had little idea on how to accomplish this alone. After a few posts on this blog, and Facebook, within a day, (really - in just a few hours thanks to Facbook), a few enthusiasts came forward expressing interest in joining, and nearby chapters as well as the American Dahlia Society all came together to help start this brand new chapter. Successful doesn't even sum up how well this first show went - which was held at Tower Hill Botanic Garden in Boylston, MA this past weekend, but I will say this - many thanks to the Boylston Police department for helping to direct traffic and for setting up extra lanes for cars turning into the garden. Oh those Gooey Glands and Hairy Appendages. A little sinister, bit scary and somewhat beautiful -the world of carnivorous plants attracts fans from all populations, from the youngest kids to the gnarliest biker dudes - as experienced this past weekend at the fall Carniverous Plant Show held by the New England Carnivorous Plant Society at the Tower Hill Botanic Garden in Boylston, MA. I can't say that I've ever attended a carnivorous plant society show before, so this was new to me - but I had been forewarned that these shows are a bit crazy - crowded, busy and packed with enthusiasts of all ages. In fact, I was so encouraged by the scope of the crowd at this weekends' show, I have never seen so many young people (i.e. "folks under 40") attending a show, let alone so many kids. These are popular shows, and it's no wonder why. Carnivorous plants are fascinating, to say the least. 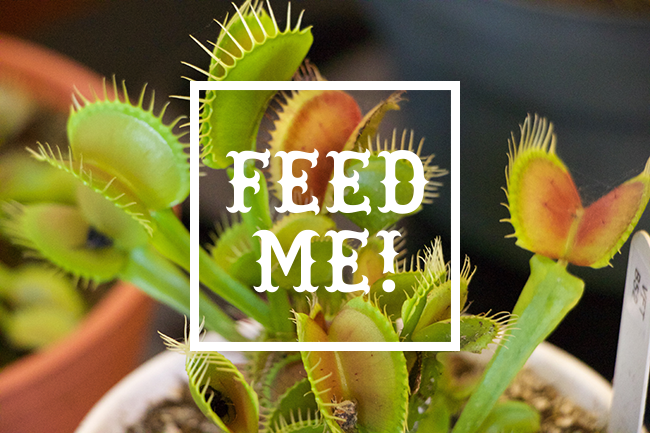 Not truly 'man-eating', these plants still offer enough interest to appeal to this very broad audience. It's fun to see second graders mingling with surgeons and tattooed bikers, yet at the same time, everyone shares a common interest - a passion for death and beauty. Who'd a thunk? 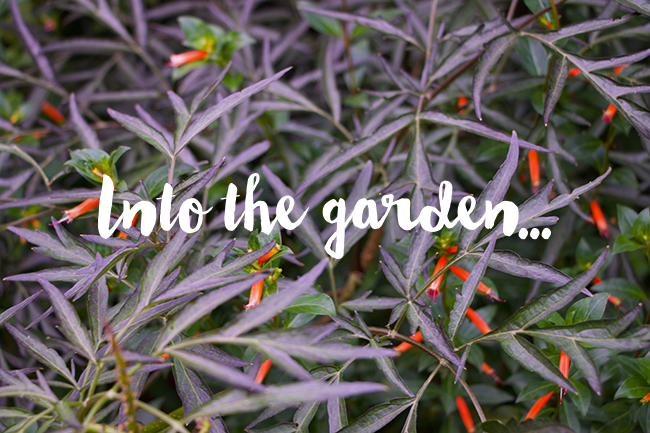 I've been neglecting both writing about what's been happening around the garden here, as well as actually spending time in the garden (it's just been either too hot and humid, or I've been traveling on the weekends). There are endless excuses, as usually, but with the return of cooler weather, I've somehow found the energy to journey out an see what's happening. So, a bit of a random post on what I am seeing around the garden on this first week of September as a tropical storm is tempting us with some rain which seems to be just out of reach, this time, as Hermine heads out to sea.